Funky Green Frosted Translucent MAD SCIENTIST GLASSES Steampunk Style Crazy Strange Goggle inspired Specs. Time Traveler Apocalypse Novelty Cosplay Costume Accessory. Wacky accessory for nerd, geek, mad doctor, zombie apocalypse, mad doctor. 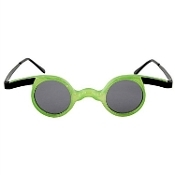 Funky and crazy novelty Mad Scientist Green Glasses with dark lenses make a wacky novelty gag gift or perfectly evil Halloween costume accessory for nerd, geek, mad doctor, zombie apocalypse or villainous mad doctor. Now you can laugh your evil laugh complete with our pair of Mad Scientist glasses in eerie frosted green. Muah-ha-ha-ha-ha! An ominous villainous laugh is harder than you think. If you're wearing these evil eye shades, your foul follies exude from you effortlessly! Features eerie green frosted translucent finish plastic frames with black enameled metal temples. These plastic frames feature frosted translucent finish and metal temples. The circular lenses with thicker frame look similar to goggles, while the design screams of mad scientist. They act as the perfect finishing accessory to any mad scientist, time traveler or Dr. Bunsen Honeydew costume. These novelty glasses are positively hysterical! -Fits adults and kids ages 12 and up. -High quality Dr Peepers brand by elope.